Bouchery, T., Camberis, M. and Gros, G. L. (2016). Dye Labeling of Live Nippostrongylus brasiliensis Larvae for Visualization in Host Tissue. Bio-protocol 6(4): e1737. DOI: 10.21769/BioProtoc.1737. Visualization of the interaction between parasitic nematodes and their host enables a better understanding of the development of the nematode during the infectious stages of its life cycle and of the effects of host response on nematode integrity in tissues. Appropriate live imaging of these nematode/host interactions, to date has been hindered by the lack of appropriate molecular tools or efficient labeling agents. Here, we present techniques for the live labeling of the nematode parasite Nippostrongylus brasiliensis (N. brasiliensis) that allows visualization of the parasite in the mouse host for up to 24 h. The external sheath can be labeled with CFSE allowing infective larvae to be identified and followed until the stage of exsheathment. The internal labeling of infective parasites can be performed by ingestion of NY microspheres. The worms can continue to be identified for up to 24 h following exsheathment. This should be applicable to other parasitic nematodes. Note: Camberis et al. (2003) provides a detailed review on the preparation of N. brasiliensis. Note: There are several labs that maintain the life cycle and can be contacted through their publication address. Note: Currently, it is “Thermo Fisher Scientific, Molecular ProbesTM, catalog number: C1157”. Note: Currently, it is “Thermo Fisher Scientific, GibcoTM, catalog number: 11995-065”. Note: Currently, it is “Thermo Fisher Scientific, GibcoTM, catalog number: 14190-144”. Note: Currently, it is “Thermo Fisher Scientific, GibcoTM, catalog number: 15140-122”. Note: Currently, it is “Thermo Fisher Scientific, GibcoTM, catalog number: 26140-079”. If only external labeling of the larvae is required, follow step A1 from the Internal labeling protocol and then proceed with the external labeling protocol. Prepare sufficient Nippostrongylus brasiliensis L3 larvae for experiment by washing larvae three times with 3 ml of PBS in a 15 ml tube and allowing larvae to settle by gravity after each wash. Allowing the larvae to settle by gravity should take approximately 15 min and the larvae should form a pellet at the bottom of the 15 ml tube. This is carried out at room temperature. Note: 600 Nippostrongylus brasiliensis L3 larvae are used per injection. By preparing at least 700 Nippostrongylus L3 per injection, it allows for any loss during the labeling procedure. Transfer the pellet of L3 into a 1.7 ml micro-centrifuge tube using a 1 ml pipette, allow the larvae to form a pellet at the bottom of the tube by gravity for approximately 15 min and then discard any remaining PBS. Add 500 μl of Wash solution I and incubate at 37 °C in a water-bath for 1 h. Following incubation, discard Wash solution I using a pipette. Prepare a suspension of 1,500 L3 per ml in Culture Solution by microscopically counting a 10 μl sample of the L3 suspension and adjusting the concentration of larvae with Culture Solution. Add 1 ml of 1,500 L3 per ml suspension into wells of a 24 well plate. Incubate at 37 °C, 5 % CO2 overnight. Add 1 μl of YO microspheres to each well and mix by gently swirling the plate. Please refer to Note 1 in the Notes section for more information regarding this step. Incubate for 4 h at room temperature in the dark by placing in a drawer or covering the plate with tinfoil. Please refer to Notes 2-3 in the Notes section for more information regarding this step. Add 1 ml Wash solution II to each well and mix by gently swirling the plate. Transfer the larvae from each well into 15 ml tubes covered with tin foil to protect from light. Let the larvae settle for approximately 15 min to form a pellet and discard supernatant. Add 3 ml Wash Solution II to each tube and allow larvae to settle by gravity. Discard supernatant and repeat at least three times or until the supernatant becomes clear. Transfer the larval pellet in a 1.7 ml micro-centrifuge tube and cover with tin foil to protect from light. Allow the larvae to settle and discard supernatant using a pipette. Add 1 μl of 10 mM CFSE to the pellet and mix by gently flicking the micro-centrifuge tube 2-3 times. Incubate at room temperature for 8 min. Add 1 ml Wash solution II and mix by inverting 2-3 times. Allow larvae to settle by gravity and discard supernatant using a pipette. Repeat wash step at least three times or until the supernatant becomes clear. Prepare a suspension of 600 L3 per 30 μl in PBS by microscopically counting a 10 μl sample of the L3 suspension and adjusting the larval concentration with PBS. Use intra-dermal (i.d.) administration of N. brasilienisis iL3 on the ventral surface (belly skin) or the ear pinnae for imaging of the skin. Hair should be plucked around the site of injection for optimal imaging results (Figure 1). Use intra-venous (i.v.) 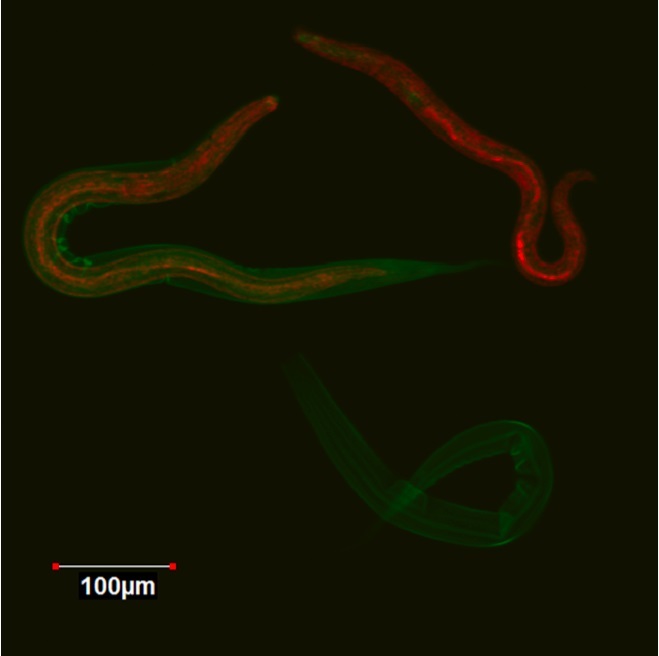 administration of N. brasilienisis iL3 for imaging of worms migrating to lung. Note: Intra-nasal administration of live larvae does not lead to direct infection and development in the lung. Rather, the infective larvae must first past into the venous blood supply from the airway mucosa and arrive in the lungs 16-18 h later. Ear-Euthanise the mouse using an approved form of euthanasia, remove the pinna using scissors and place in a Petri dish containing cold PBS for approximately 15 min to lightly anaesthetize the larvae. Belly skin-Euthanise the mouse using an approved form of euthanasia, cut a 1 cm x 1 cm piece of skin around the injection site using scissors, peel skin off and place the skin piece ventral side down in a Petri dish containing cold PBS for approximately 15 min to lightly anaesthetize the larvae. Take care to spread the skin out. Lung-Euthanise the mouse using an approved form of euthanasia. Expose the thoracic cavity and remove the lungs in one piece and place in a Petri dish containing cold PBS for approximately 15 min to lightly anaesthetize the larvae. Transfer the tissue onto a glass slide. Belly skin-Place a cover slip onto the tissue. 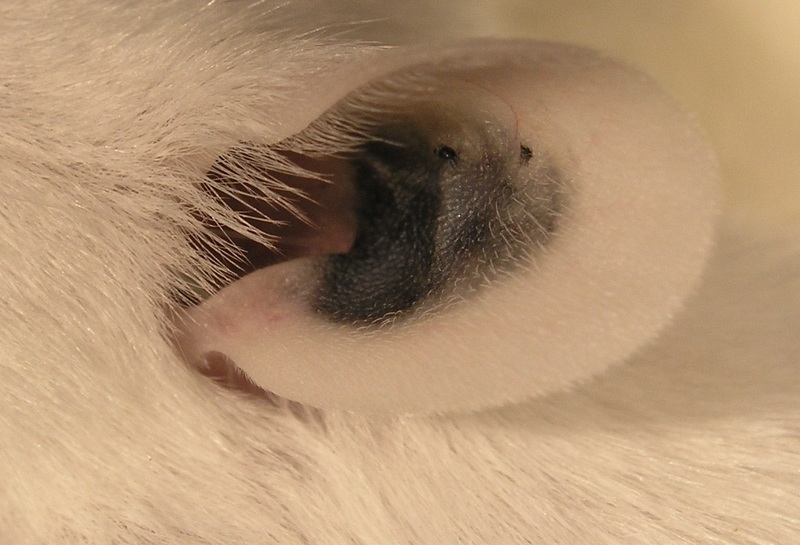 Ear-Flatten the ear pinna as much as possible. Lung-Place lung ventral side up. Image using fluorescent stereomicroscope or Confocal microscope for more detailed imaging in the tissue. Two thorough reviews of the basic techniques involved in the preparation, handling and use of N. brasiliensis are Kassai (1982) and Camberis et al. (2003). The protocol outlined above enables reproducible staining of nematodes and their visualization in vivo in tissues for up to 24 h.
N. brasiliensis larvae need to be feeding for the ingestion of fluorescent YO microspheres. In order to activate feeding, larvae need to be incubated at 37 °C in 5% CO2 for a 10-h incubation period. Incubation periods of six hours or less are insufficient to activate the larvae to feed. The microspheres used in this protocol are fluorescent polystyrene microspheres that have carboxylate groups on their surfaces, which can aid in the covalent coupling of proteins. They can be toxic to the larvae; both the volume of microspheres and incubation times are critical factors in determining whether the larvae will survive. Microsphere volumes greater than 1 μl microspheres are toxic and should be avoided. The four-hour incubation period of the microspheres with the larvae has been optimized to allow for a signal bright enough for in vivo visualization with minimal toxicity, as larvae can still complete the life cycle through to fecund adults in the gut. In our hands, incubation times greater than 4 h are toxic, however, incubation times less than 4 h do not provide a bright enough signal for in vivo visualization. This protocol was adapted and modified from Hawdon and Schad (1990) and from previous work carried out by Professor Weninger’s Immune Imaging Team at Centenary Institute, Australia. We thank the Hugh Green Cytometry Core for confocal microscopy assistance. This work was supported by The Health Research Council of New Zealand and the Marjorie Barclay Trust. Bouchery, T., Kyle, R., Camberis, M., Shepherd, A., Filbey, K., Smith, A., Harvie, M., Painter, G., Johnston, K., Ferguson, P., Jain, R., Roediger, B., Delahunt, B., Weninger, W., Forbes-Blom, E. and Le Gros, G. (2015). ILC2s and T cells cooperate to ensure maintenance of M2 macrophages for lung immunity against hookworms. Nat Commun 6: 6970. Camberis, M., Le Gros, G. and Urban, J., Jr. (2003). Animal model of Nippostrongylus brasiliensis and Heligmosomoides polygyrus. Curr Protoc Immunol Chapter 19: Unit 19 12. Camberis, M., Prout, M., Tang, S. C., Forbes-Blom, E., Robinson, M., Kyle, R., Belkaid, Y., Paul, W. and Le Gros, G. (2013). Evaluating the in vivo Th2 priming potential among common allergens. J Immunol Methods 394(1-2): 62-72. Harvie, M., Camberis, M., Tang, S. C., Delahunt, B., Paul, W. and Le Gros, G. (2010). The lung is an important site for priming CD4 T-cell-mediated protective immunity against gastrointestinal helminth parasites. Infect Immun 78(9): 3753-3762. Hawdon, J. M. and Schad, G. A. (1990). Serum-stimulated feeding in vitro by third-stage infective larvae of the canine hookworm Ancylostoma caninum. J Parasitol 76(3): 394-398. Kassai, T. (1982). Handbook of Nippostrongylus brasiliensis, Akademia Kiado, Budapest, ISBN-10: 9630529769. How to cite: Bouchery, T., Camberis, M. and Gros, G. L. (2016). Dye Labeling of Live Nippostrongylus brasiliensis Larvae for Visualization in Host Tissue. Bio-protocol 6(4): e1737. DOI: 10.21769/BioProtoc.1737.